Successfully Added 1 DIN Car Stereo - For Volkswagen Jetta, Car DVR, Parking Camera, 10.2 Inch Display, WiFi, 3G&4G CAN BUS, Octa-Core CPU, GPS to your Shopping Cart. 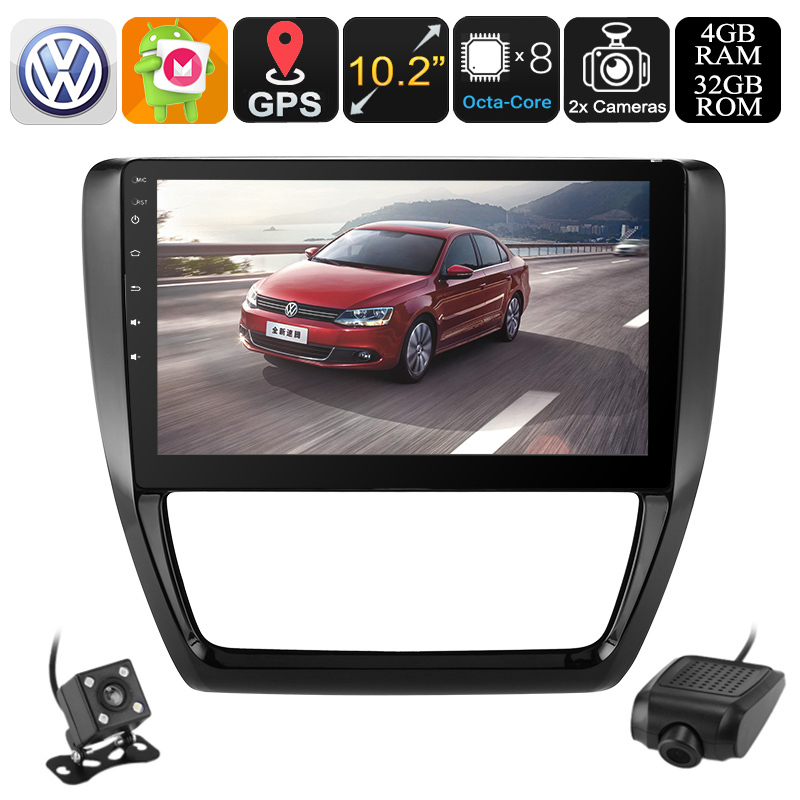 Bring the latest Android features into your vehicle with this one DIN car stereo for the Volkswagen Jetta (Model 2012 – 2017). This stunning car accessory puts a large 10.2-Inch display into your dashboard on which you and your passengers can enjoy countless Android features. Take its 20-channel GPS navigation system for example. Thanks to this, your car media player makes sure that you’ll never get lost again. Simply insert the Android map of your liking and you’ll be treated to a clear route that leads you to your next destination. From now on, you’ll always be up to date with the latest traffic information and are sure that you’ll never be late again. Besides its GPS navigator there is so much more to experience as its Android 8.0.1 operating system brings along unlimited in-car entertainment possibilities. If you are having trouble entertaining the kids during long road trips or holidays abroad, this Android media player offers the perfect solution. Coming with Google Play installed, this 1 DIN car stereo offers you with access to an unlimited source of free entertainment. Download the latest Apps, games, and movies. With this car media player in your Volkswagen, your passengers will never be bored again. Additionally, it also supports WiFi and 3G connectivity (dongle not included). Therefore, you’ll be able to browse the web, stream movies, and download files at any given moment. With its Octa-Core processor and 4GB RAM, this car gadget is sure to handle all the basic types of entertainment without dropping a frame. Naturally, this car stereo also supports regular AM/FM frequencies for those of you that simply wish to listen to the radio. Additionally, it lets you insert your own music via its SD card slot or USB input. With 32GB internal storage and 64GB external memory support, there is plenty of space for you to keep your media, maps, and files. Your 1 DIN car stereo also supports Bluetooth. This means you’ll be able to synchronize it with your smartphone after which it lets you listen to your mobile music library or engage in hands-free phone calls. With its four 45W speakers, this car accessory brings forth great audio at any time.